The Association of Small Direct Wine-Merchants (ASDW) was formed in 2004 and is a group of British independent small wine merchants selling niche wines online and at wine fairs. We offer usually exclusive wines directly imported from the wineries. Doors open at midday. Entry is £5 and all the proceeds are going to Facial Palsy UK. 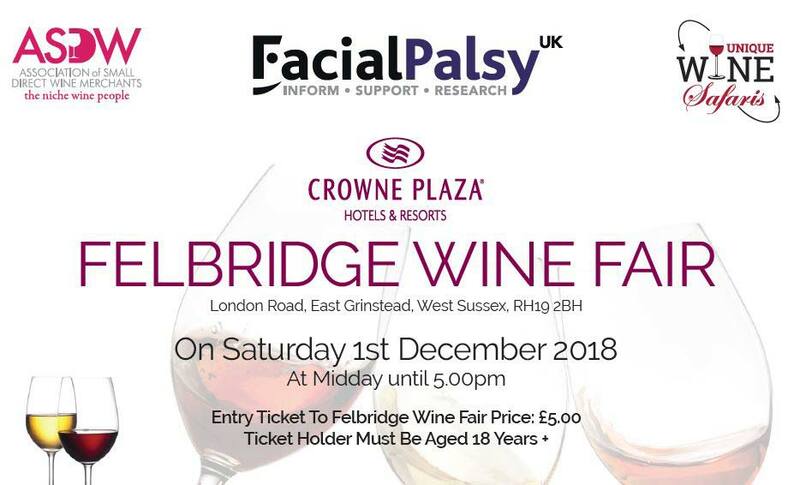 Together with Unique Wine Safaris, (info@uniquewinesafaris.com 01293 734664) specialists in wine tours, it’s hoped that the Felbridge Crowne Plaza Wine Fair will be an annual event showcasing international wines in East Grinstead. The ASDW are passionate about wine! What can you expect from ASDW at the Felbridge Crowne Plaza? Customers can expect a relaxed, unbiased and professional opinion and the convenience of discussing their requirements face to face with the wine merchants. For £5, customers are given a loan glass and able to taste the wines on show and if they like what they taste, customers are able to buy direct. There’s no need to buy by the case, which means that during their visit, customers can build up a bespoke selection of wines from ones that they have personally tasted & enjoyed. The ASDW niche ranges of wine are specially selected from all over the world and the virtues of quality, taste and flavour always take precedence over brands and mass production. The wines on offer are often from small growers and family run wineries where tradition and quality really matter. In nearly all cases we have personally visited the wineries before importing so have a good relationship with the producers. Many of our members have a portfolio of business interests ranging from a former Marketing Director of a global soft drinks based firm, models, investment bankers, lawyers, e-commerce consultants, physicists and a former RAF pilot and active airline pilot.